Nissan was arguably one of the big draws at CES 2017, with their Seamless Autonomous Mobility (SAM) collaboration with Nasa building on its current reputation as a pioneer in the autonomous drive field. Indeed, T3 met up with Nissan multiple times last year to check up on their latest AD and EV (electric vehicle) technologies - as well as spending an enlightening hour interviewing Maarten Sierhuis, the head of the company's LA-based research team - and each time we were won over with its forward-thinking approach. In particular, Nissan's work on ProPilot - an autonomous drive assist system that is being installed in the Nissan Leaf and Nissan Qashqai in 2017 - was particularly impressive, with its focus on the more affordable end of the consumer market enthusing. After all, if Nissan can bring these advanced technologies to a broad range of its vehicles, not just the high end, then everyone will benefit and be able to help catalyse the progress that will only come from wide-spread adoption. 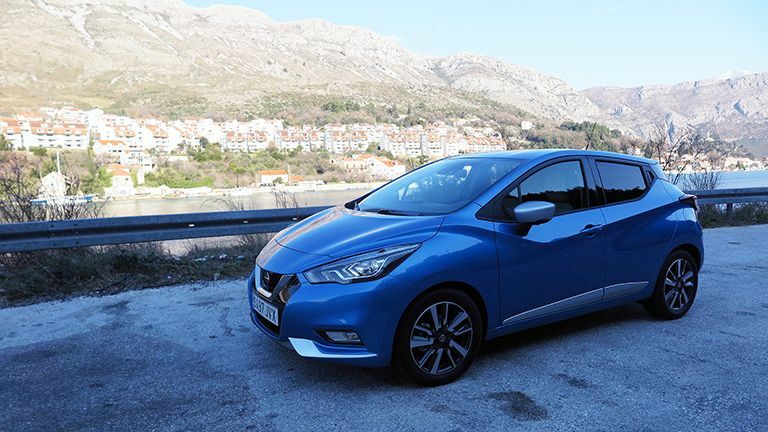 Which is why we were excited here at T3 Towers to receive an invitation to attend the launch of the new Nissan Micra in Dubrovnik, Croatia. Long-established in Europe, the Micra is arguably the epitome of an everyday compact car runaround, so if the new version can impress and be a potential candidate for future integration of Nissan's smart new technologies, then the Japanese car maker will have done what very few others have managed. Dubrovnik is a small and rocky city in Croatia that borders onto the Adriatic Sea. Boasting stunning views, winding coastal roads and clear, greenish waters, it is unsurprisingly a tourist hot spot during the warmer, summer months, a fact that has increased dramatically as of late thanks to it also been the place where they filmed King’s Landing in Game of Thrones. For us, however, flying in to the old city out of season amidst minus temperatures, it is the location of Nissan’s new Micra press event, a two-day opportunity to put the car through its paces in a series of test drives, and also get up close and personal with some of the people responsible for its rebirth. And rebirth is definitely the word. Despite the Nissan Micra performing admirable sales-wise worldwide since its initial launch in 1983, as of late - in the UK especially - its has gained a largely uninspiring reputation, especially when compared to competitor vehicles in its class. Nissan, clearly acting on feedback, has gone right back to the drawing board with the new Micra and the result, we think it fair to say, is one of the most aggressive modernisations we’ve seen over the past few years. Longer, lower and far more angular than previous iterations, at first sight you’d be forgiven for confusing the new Micra with a new vehicle altogether. Sportier and more dynamic in look, the Micra's exterior is considerably more expressive than before, with a floating roof effect, sharp lines and boomerang-shaped light clusters combining to good effect. Inside things are, arguably, even more dramatically different. Central to the new cabin is the T-shaped dashboard, which holds cleverly clustered instruments and controls, while the rest of the cabin exudes a smart level of refinement with aspects such as two-tone and soft-touch materials, as well as redesigned D-shape, multi-function steering wheel as standard. Other things to note in terms of the interior is that the driving position is lower than previous models, the front seats offer excellent adjustment capabilities, boot capacity sits at 300 litres and, in what was music to T3's ears, the new Nissan Micra now boasts a state-of-the-art Bose Personal audio system. Bose Personal is a sound system that allows the driver to select varying levels of audio immersion depending on the type of experience they want, ranging from a narrow, frontal delivery, to a wide 360-degree delivery. The system achieves this by embedding a series of 6cm Bose UltraNearfield speakers in the driver's headrest which, in partnership with Bose PersonalSpace Virtual Audio Technology, allows the system to create a wide sound field with enhanced musical depth. T3 tested the system while cruising around Dubrovnik - we listened to the audio gold that is Mile Davis' Sketches of Spain - and, while in narrow mode the sound system was largely indistinguishable from other high end systems, when switched to wide mode, with 360-degree delivery, the system really piqued our interest. The levels of sound immersion, especially when sat in the driver's seat, were another level from what we've previously experienced from an in-car sound system, especially in a small vehicle. The new Nissan Micra is available in with three different downsized engines, two petrol and one diesel, all linked to a five-speed manual gearbox. For our test drive in Dubrovnik we were in the 1.5 dCi, the 4-cylinder turbo diesel variant that delivers 88.5 HP, a 0-62 mph time of 11.9 seconds and a maximum speed of 111 MPH. Naturally, cruising on Dubrovnik's snaking coastal roads, nipping into and then out of smaller settlements, was no problem for such a vehicle, and T3 was pleased to hear that despite being a diesel, the new Micra didn't sound like a tiny tractor. On the contrary, moving through the car's gears was a slick experience and despite the obvious lack of real power for fast acceleration, we found kicking back into linear commuting mode surprisingly easy. Where we were surprised was when we left the coastal roads and headed up into the hills. Winding, gravel strewn roads necessitated a considerably more hands on driving experience and, in what we can only put down to the new Micra's Active Ride Control and Active Trace Control, we found the vehicle surprisingly responsive and easy to handle. The car's Intelligent Ride Control, according to Nissan, improves the ride quality by using the engine and the brakes to moderate the fore/aft pitching motion often felt when going over bumps and disturbances in the road, while the Intelligent Trace Control aids cornering by automatically engaging and adjusting the brakes on the inside of the vehicle and the wheels on the outside. On the night following the test drive Nissan held its official press conference for the new Micra, which involved driving a brace of the new vehicles down a tech-packed catwalk. Here it was revealed that as well as being available with three different engines, the vehicle would be marked with five-model grade structure staring at £11,995. This included the Visia, Visia +, Acenta, N-Connecta and Tekna, with the price and included options as standard going up each time. We won't go into the details here, as they are available to peruse on Nissan's website, however we did note that Bose Personal only comes as standard on the top of the range Tekna, with it being added into other models at a £500 cost. Budget constraints aside, customisation and personalisation are, without doubt, massive strengths for the new Nissan Micra. Both the interior and exterior can be massively changed with features and colours tweakable. For example, the interior of the cabin has four distinct areas that can be completely changed, the seat bolsters and pad, door arm rest, knee pad and instrument panel. While the exterior can be kitted our with five styles of alloy wheels, as well as things like door mirror caps, body stickers and front and rear bumper finishers. Waking up the following day in Dubrovnik ready for a second test drive, the weather had taken a severe turn for the worst as, for the first time here in January in 20 years, it had snowed all night. Dubrovnik's roads are taken out of commission and our fleet of test drive cars firmly stuck in their garages - local delivery vehicles can't even get into and out of our hotel's resort. There's nothing else to do but wait for the snow to stop and an emergency vehicle fitted with snow tyres to comes and take us back to the airport for our flight home. And that's fine, as it gives us chance to reflect on the new Nissan Micra while looking out over the icy Adriatic sea. There's no doubt about it that this car is miles better and more premium than any previous iteration. Everything about the new Micra is now class competitive or, in come cases, arguably class leading. The Bose Personal audio system, for example, is a really impressive addition that, as well as delivering something new, is integrated into the car really slickly. As audiophiles, it was genuinely exciting to hear it in action. The handling, which was one of the primary areas of concern going into the test drive, actually proved to be on the money too, with Nissan's efforts in Intelligent Ride and Trace Control seemingly paying off well. Throw in competitive boot, cabin and MPG too, as well as the aforementioned customisation options, and overall you've got a stylish new entry to the market. And we think that "style" is definitely a word we'd take away from the new Nissan launch. The new Nissan Micra has a renewed sense of style and, after years of that not being its bag, it's pleasing to see, as that style combined with a renewed focus on driving experience-enhancing technology, have transformed this vehicle from also-ran runaround into a genuine contender.